Grades Pre-K and K: Rainbow colors!! 2) Tuesday: Sports team day! 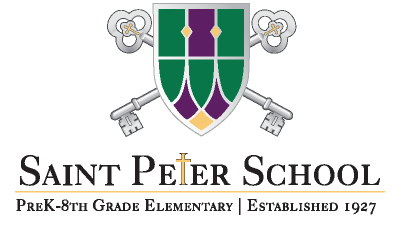 Students may wear a shirt or sweater that represents their favorite sports team and/or a St. Peter School shirt/sweater. Additionally, in the afternoon we will have some fun activities: relay races for various grade levels, and the 8th grade Boys Varsity Team will take on the 8th grade Girls Varsity Team! Mr. Saffioti will also announce the dress down pass for the National Catholic School Day of Giving Drive during Catholic Schools Week! 3) Wednesday: Super Hero Day! Students may wear a shirt that reflects their favorite superhero or other "super wear"! 4) Thursday: we will have our annual Academic Race in the gym (parents are welcome to come out and watch!). Students may wear their gym uniform. 5) Friday - Patriotic Day; students are asked to wear Red, White, and Blue to celebrate the U.S.A.
We do ask that on Friday, students bring $1 in as the proceeds to cover that dress down day will support the work of the St. Anthony Club in providing bagged lunches for the poor in Camden.